Volume predictions of sample trees are basic inputs for essential National Forest Inventory (NFI) estimates. The predicted volumes are rarely comparable among European NFIs because of country-specific dbh-thresholds and differences regarding the inclusion of the tree parts stump, stem top, and branches. Twenty-one European NFIs implemented harmonisation measures to provide consistent stem volume predictions for comparable forest resource estimates. The harmonisation of forest information has become increasingly important. International programs and interest groups from the wood industry, energy, and environmental sectors require comparable information. European NFIs as primary source of forest information are well-placed to support policies and decision-making processes with harmonised estimates. The main objectives were to present the implementation of stem volume harmonisation by European NFIs, to obtain comparable growing stocks according to five reference definitions, and to compare the different results. 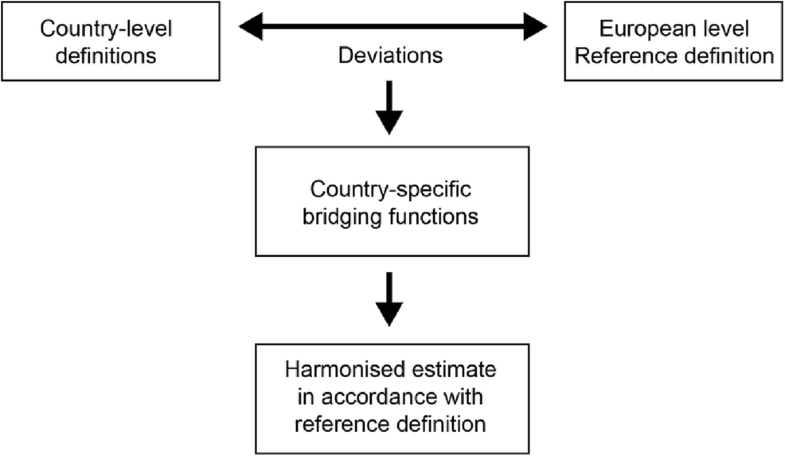 The applied harmonisation approach identifies the deviations between country-level and common reference definitions. The deviations are minimised through country-specific bridging functions. Growing stocks were calculated from the un-harmonised, and harmonised stem volume estimates and comparisons were made. The country-level growing stock results differ from the Cost Action E43 reference definition between − 8 and + 32%. Stumps and stem tops together account for 4 to 13% of stem volume, and large branches constitute 3 to 21% of broadleaved growing stock. Up to 6% of stem volume is allocated below the dbh-threshold. Comparable volume figures are available for the first time on a large-scale in Europe. The results indicate the importance of harmonisation for international forest statistics. The presented work contributes to the NFI harmonisation process in Europe in several ways regarding comparable NFI reporting and scenario modelling. Our work-package leader, colleague and dear friend Jean-Christophe Hervé passed away during the project period. He greatly supported and significantly contributed to the harmonisation activities of our group, and to the scientific work of ENFIN. We remember his scientific expertise and dedication, his visionary spirit and warm personality. Volume predictions of sample trees are the basic inputs for essential National Forest Inventory (NFI) estimates such as growing stock, increment, and fellings. The NFI estimates derived from sample tree volumes serve many information needs at country and international levels including the availability and use of wood resources (Bosela et al. 2016; European Parliament and Council of the European Union 2009; UNECE/FAO 2011; Vidal et al. 2016a), sustainable forest management (FOREST EUROPE, UNECE and FAO 2011; FOREST EUROPE 2015), greenhouse gas (GHG) reporting (Dunger et al. 2012; IPCC 2006; United Nations 1992; United Nations 1998) and biodiversity (EC 2003; European Commission 2015; McRoberts et al. 2012; Winter et al. 2008). International programs like the Forest Resources Assessment (FRA) of the United Nations Food and Agriculture Organisation (FAO) and the assessment of the Status of Europe’s Forest (SoEF) of FOREST EUROPE require forest information about e.g. growing stock, biomass, carbon and wood removals at periodic intervals of about 5 years (FAO 2015; FOREST EUROPE 2015). NFIs in Europe were established at different time periods in the twentieth and twenty-first centuries. They were primarily motivated by country-level information needs such as forest management planning and forest industry planning in Nordic countries, and monitoring sustainable forest utilisation in central Europe (Tomppo et al. 2010b). Tomppo et al. (2010a) and Vidal et al. (2016a) give a comprehensive overview about NFIs including information about data collection and estimation methods. The different NFI features often have been developed to accommodate the unique topographies, climates, forest types and commercial interests in the countries (McRoberts et al. 2010). As a consequence, forest resource information at the European level displays a lack of comparability across country borders. To achieve comparability in forest resources information in Europe, a harmonisation process was launched in the 1990s with the establishment of the European Forestry Information and Communication System EFICS (1997). The EFICS study collected information about the methods used for forest resource assessments in EU and EFTA countries, analysed the differences among the existing inventory systems, and carried out an information needs assessment. The Global Forest Resources Assessment FRA 2000 (FAO 2001) and its regional contribution TBFRA (UNECE/FAO 2000) were the first assessments to use a homogenous set of definitions, including definitions for growing stock and standing volume. These definitions were revised in the subsequent FRAs (compare FAO 2004, 2010, 2012a) which further contributed to the harmonisation of NFIs. The importance of harmonisation is expressed in the long-term strategy of FRA reporting in FAO (2012b). Vidal et al. (2016b) provide a comprehensive review on the role of NFIs in international reporting processes and the challenges associated with the lack of comparability. In the early 2000s, European NFIs formed the European National Forest Inventory Network (ENFIN 2018) to exchange knowledge, cooperate and promote NFIs as comprehensive monitoring systems by harmonising information on forest ecosystems. This led among other things to two successive COST Actions, E43 (2010) and FP1001 (2014). COST Action E43 (2010) built upon and integrated the previous harmonisation efforts of EFICS (1997), FAO (2001) and UNECE/FAO (2000) by establishing a general harmonisation approach for European NFIs that relies on common reference definitions and bridging functions (Tomppo and Schadauer 2012). As methodological contribution to NFI harmonisation, Ståhl et al. (2012) presented a framework for constructing bridging functions and distinguished between two main levels at which bridging functions can be applied: the level of individual sampling units like sample trees and sample plots, or aggregate levels of country- or sub-country-level results. Different examples of bridging functions for harmonising growing stock estimates were presented by Tomter et al. (2012) for Finland, Germany, Italy, Lithuania, Norway and Sweden, and by Ståhl et al. (2012) for Belgium. A harmonised definition and bridging functions for above-ground biomass were recently implemented by 26 European NFIs to obtain comparable estimates at country- and sub-country levels (Henning et al. 2016; Korhonen et al. 2014). Deviations in volume and biomass estimates of European NFIs are mainly caused by country-specific thresholds for the diameter at breast height (dbh) for sample tree selection, and the inclusion or exclusion of tree parts like stump, stem top or branches in the volume predictions for sample trees. For example, different dbh-thresholds between 0 and 12 cm can lead to an underestimation of volume estimates by 0.7–16.1% (Cienciala et al. 2008; Kuliešis and Kulbokas 2009; Mantau et al. 2016). Stumps are reported to account for 1.8 to 3.3% of the stem (Hladnik and Kobal 2012; Mantau et al. 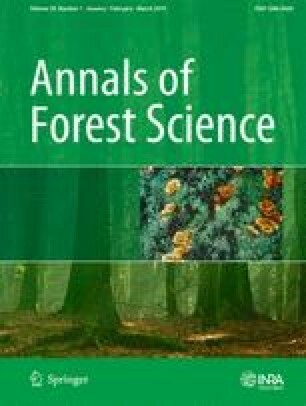 2016), and branches of hardwoods together with stem tops contribute 21.6% of the above-ground biomass (Mantau et al. 2016). These figures suggest substantial discrepancies in the volume estimates of European NFIs; however, an evaluation at European scale has not been performed until now. Under the Horizon 2020 project entitled “Distributed, Integrated and Harmonised Forest Information for Bioeconomy Outlooks” (DIABOLO 2015), the harmonisation process of European NFIs has continued. In order to improve the information about European forest resources, harmonisation measures were implemented by 21 NFIs to obtain harmonised stem volume estimates. The objectives of the present work are to demonstrate the implementation of stem volume harmonisation and the involved approaches, to calculate comparable growing stock estimates according to the reference definition of Cost Action E43 (2010) and four alternative reference definitions, and to conduct comparisons between the different growing stock results in order to quantify the impact of deviations from the reference definition of Cost Action E43 (2010), to evaluate the percentage of the merchantable stem part, and the contribution of the stump, stem top, trees below the dbh-threshold and large branches. The results are discussed along the objectives of this work and brought into context with the overall NFI harmonisation process in Europe. The harmonisation of stem volumes was accomplished under the framework conditions given by the existing data sources and volume models within the NFIs as well as the general harmonisation method established for European NFIs (McRoberts et al. 2010; Tomppo and Schadauer 2012; Vidal et al. 2008). Thus, firstly, the NFIs as data basis for harmonisation are described with an emphasis on the differences relevant for harmonisation. Secondly, the harmonisation approach with the established reference definitions and applied bridging functions are specified. And thirdly, the implementation of stem volume harmonisation by European NFIs, its components and the performed calculations are presented. The harmonisation of stem volume estimates involved sample-based NFIs from 21 European countries: Austria (AT), Belgium (BE), Czech Republic (CZ), Denmark (DK), Estonia (EE), Finland (FI), France (FR), Germany (DE), Hungary (HU), Ireland (IE), Latvia (LV), Lithuania (LT), Norway (NO), Portugal (PT), Romania (RO), Serbia (RS), Slovakia (SK), Slovenia (SI), Spain (ES), Sweden (SE) and Switzerland (CH). Together, these countries have a forest area of 145 million ha, a growing stock of 22,600 million m3 and fellings of 462 million m3 compared to an increment of 636 million m3 (FOREST EUROPE 2015), which, however, are not harmonised figures. Numerous features such as sampling grids, plot configurations, inventory cycles, sample tree selection methods, applied thresholds and the models used for volume estimation describe the methods of European NFIs (Tomppo et al. 2010a; Vidal et al. 2016a). An overview about the NFI sampling methods relevant for growing stock estimation is given in the Appendix Table 7. In total, the implementation of stem volume harmonisation is based on the sample tree data collected at approximately 390,000 NFI plot locations. In most cases, the plot design for sample tree selection are concentric circular plots and less frequently angle count samples or singular circular plots. In recent years, many NFIs have augmented their field data collection by integrating specific assessments about small trees (0.0 cm < dbh < dbh-threshold). Usually, these assessments are stem counts by species and dbh-classes on additional small and often circular plots. In several instances, also height assessments are made for small trees. Figure 1 shows the parts of a tree as defined for European NFIs (Gschwantner et al. 2009; Lanz et al. 2010) and the threshold values applied by the NFIs for volume estimation. The dbh-thresholds range between 0.0 (minimum height = 1.3 m) and 12.0 cm, with 0.0 cm, 5.0 cm, and 7.0 cm or 7.5 cm being the most frequent. The stem top diameter threshold is in most cases 0.0 cm, meaning that the stem top is completely included in volume estimates. NFIs that exclude the stem top usually apply a diameter threshold value of 7.0 cm. Also the branch diameter threshold is in the majority of cases 7.0 cm when applicable. The stump height threshold is often defined rather general as “the height where the tree would be cut in felling”. Several NFIs specify the felling height more concretely as for example by 1% of the tree height. The differences in volume predictions originate from the dependent variables of the volume models applied by the NFIs to estimate the volume of individual sample trees. The volume models differ in terms of modelling concepts (e.g. taper curves, form factor functions, direct volume prediction), function types (e.g. power functions, exponential functions, linear combinations) and required input variables (e.g. species, dbh, height). The differences between the volumes predicted by the volume models of the 21 NFIs in terms of included tree parts are summarised in Table 1. Further details about the volume models including literature references are available in Appendix Table 8. 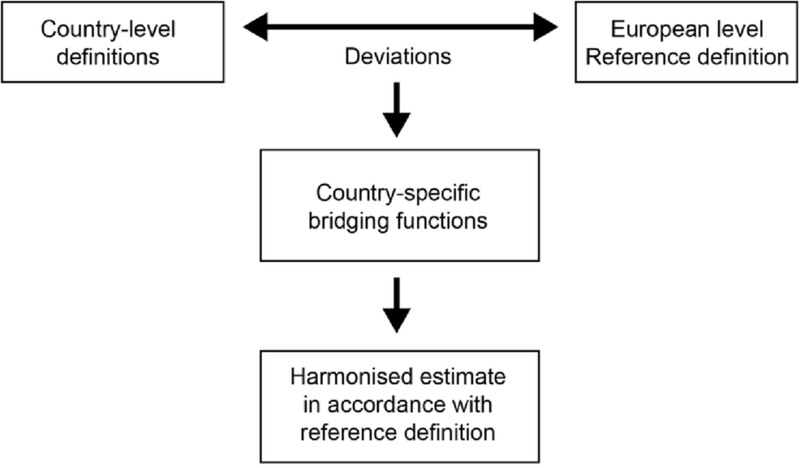 The general harmonisation approach established for European NFIs has two basic components: common reference definitions and bridging functions to convert estimates based on country-level definitions into estimates in accordance with common reference definitions (McRoberts et al. 2010; Tomppo and Schadauer 2012; Vidal et al. 2008). Thus, a definition-based method is applied in which the deviations between country-level and commonly agreed reference definitions are assessed and adjusted by bridging functions (Fig. 2). An estimate is considered to be harmonised when it is in line with the reference definition. Because both the country-level definitions and the European reference definitions for stem volume and growing stock are described by the same specific variables with specific thresholds, the deviations between them can be clearly identified and allow for the implementation of harmonisation measures. Reference definitions define the target object of interest (e.g. stem volume, growing stock) for the purpose of harmonisation (Vidal et al. 2008). A set of Europe-wide and commonly agreed reference definitions was developed during COST Action E43 (2010) which includes definitions for the volume of stems and growing stock, as well as for tree parts, thresholds and tree characteristics (Gschwantner et al. 2009; Lanz et al. 2010; see Appendix Table 9). 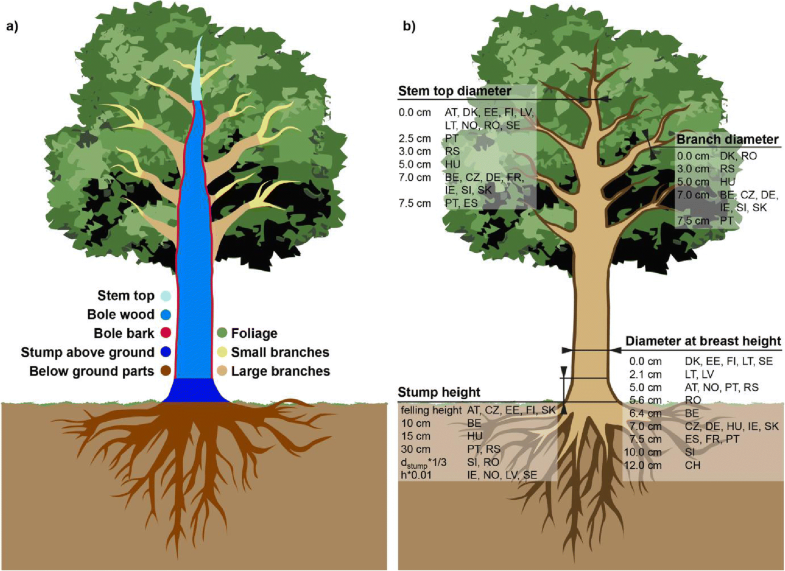 According to these reference definitions of COST Action E43 (2010), growing stock aggregates the volume above stump height including the bole (wood and bark) and the stem top of trees above the dbh-threshold of 0 cm (height > 1.3 m) that are living and standing or lying (Lanz et al. 2010) or only standing (Vidal et al. 2008). Based on the already existing definitions, a more flexible scheme of reference definitions was established and agreed among the partner NFIs in the DIABOLO (2015) project. In order to fulfil different information needs, five different combinations of tree parts included in the volume predictions of individual sample trees were specified (Table 2). The dbh-threshold of 0 cm (height > 1.3 m) of COST Action E43 (2010) was retained, and only standing and living trees were included in all five reference definitions. Diameter thresholds of 7 cm for the stem top and large branches, and stump heights according to felling practices in countries were defined. The reference definitions are named “Whole stem”, “Cost Action E43”, “Control”, “Merchantable stem”, and “Merchantable stem and branches”. The definition “Cost Action E43” is identical to the reference definition of Cost Action E43 (2010), and the “Control” was introduced for result verification (Table 2). The bridging functions applied for stem volume harmonisation can be attributed to three groups of basic approaches: alternative volume models, complementary models and taper curve models (Table 3). As the NFIs differ considerably, also the bridging functions within the three groups vary in terms of model types and required variables. An overview about the bridging functions chosen and applied by the NFIs is available in Appendix Table 10. Sometimes a combination of the three basic approaches was used wherefore in these cases the bridging function considered as characteristic for the applied approach is given. 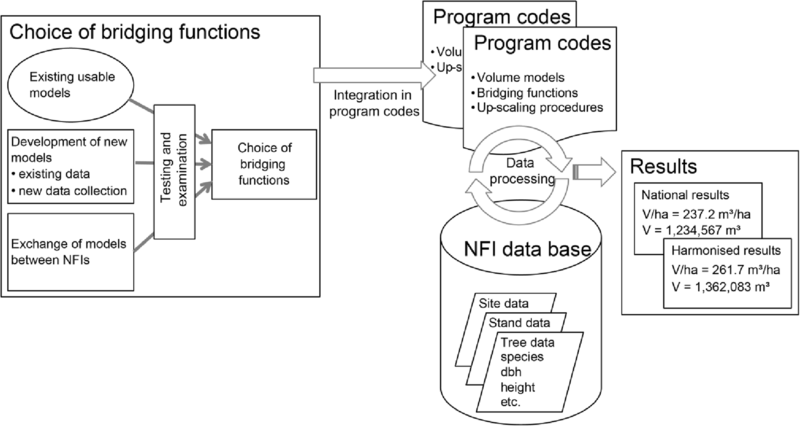 The implementation of harmonisation measures by the individual NFIs has three basic components, the NFI data-bases, the program codes containing the volume models and up-scaling procedures, and the bridging functions that have to be integrated into the program codes (Fig. 3). The NFI data-bases contain sample tree-, stand- and site-specific data collected on the plots during the different NFI campaigns. An overview about the variables assessed by NFIs is available from the National Forest Inventory reports presented by Vidal et al. (2016a). The volume models of NFIs and also the bridging functions require mostly sample tree-specific data such as species, dbh and tree height as input for calculating stem volumes (Appendix Tables 8 and 10). The program codes contain the algorithms for calculating NFI estimates and include the volume models used by NFIs for stem volume estimation. The bridging functions were integrated in a separate set of program codes which process the NFI data. Un-harmonised and harmonised sample tree volumes were predicted and then up-scaled to obtain growing stocks according to the country-level definitions, the reference definition of Cost Action E43 (2010) and the alternative reference definitions. The bridging functions can have different forms depending on the type of volume model used by an NFI, the kind of existing NFI data and other available data sources. The bridging functions can originate from already existing models, the re-parameterisation of available models or the development of new models. The harmonisation in the DIABOLO (2015) project was facilitated and supported by a mutual exchange of bridging functions between NFIs. Consequently, the same deviation from the reference definition could be solved by more than one bridging function and required the choice of the most reliable option. Therefore, the bridging functions underwent an examination phase before their implementation. The choice of bridging functions was guided by the aim to avoid biased volume predictions. The estimation of growing stock from sample tree volumes requires additional tree characteristics to define the target object within the population of perennial woody plants (Vidal et al. 2008). According to reference definition of COST Action E43 (2010), shrub species and dead trees do not belong to growing stock and therefore were excluded from the calculations. Lying living trees may also be excluded (Vidal et al. 2008; Lanz et al. 2010). Since the majority of NFIs exclude lying living trees or can filter them out subsequently, these trees were not included in the calculated growing stocks. Thus, the calculated growing stocks include living and standing trees. The country-level totals of growing stock are calculated by aggregating the sample tree volumes per hectare and plot, dividing by the number of sample plots nj, and multiplying this mean volume per hectare with the area of the forest category relevant for growing stock Fgs. If the sampling intensity within a country is not constant, stratum-wise weighing factors need to be added in Eqs. (5) and (6). where VcK is the un-harmonised country-level growing stock, VrK = 1 is the growing stock including the whole stem, VrK = 2 is the growing stock according to the reference definition of Cost Action E43 (2010), VrK = 4 is the growing stock including the merchantable stem part above stump up to the stem top diameter of 7 cm, Vrbl,K = 4 is the broadleaved growing stock including the merchantable stem part, and Vrbl,K = 5 including the merchantable stem and branches (see Table 2). The non-merchantable stem part was further differentiated into the stump and stem top. For VrK = 1, the percentage of trees below the dbh-threshold were calculated to estimate the contribution of this fraction. The implementation of stem volume harmonisation was conducted by the NFIs themselves. No common data set was compiled. Data will not be made available. Anyway, the value of the manuscript is rather the presentation of the implementation and the approaches than the data sources. The growing stocks according to the country-level definition and according to the Cost Action E43 (2010) reference definition are presented in Table 4 and reveal differences in the range from − 8 to + 32%. The magnitude of the differences depends on the kind of deviations between the country-level and the reference definition as subsequently described. The growing stocks of two NFIs (Finland, Sweden) correspond to the reference definition of Cost Action E43 (2010). The growing stocks of Austria, Latvia and Norway deviate only regarding the dbh-threshold and Estonia concerning the stump. In all other cases, the difference is the result of several partial deviations. Only positive deviations from the reference definition add up for the Danish NFI (stump, large branches), and only negative deviations for Belgium (dbh-threshold, stem top, young conifer stands excluded) and Spain (dbh-threshold, stem top). For the remaining NFIs, the differences result from positive and negative deviations. The positive deviations are either only due to branches (Czech Republic, Slovakia), only due to stumps (France, Lithuania and Switzerland), due to branches and stumps (Denmark, Germany, Portugal), or due to branches, stumps and standing dead trees (Serbia). These positive deviations are counterbalanced by negative deviations, either solely by the dbh-threshold (Lithuania, Romania, Serbia, Switzerland), by the dbh-threshold and the stem top (France, Germany, Hungary, Ireland, Portugal, Slovenia), or by the dbh-threshold, the stem top and the bark (Czech Republic, Slovakia). The growing stocks including the whole stem volume as well as including only the merchantable part are presented in Table 5. The percentage of merchantable volume varies between 87 and 96%. The lowest values were estimated for northern countries (Finland, Norway), southern Europe (Portugal, Spain, Serbia), the southwest (France) and the northwest of Europe (Ireland). Reversely, the percentages of non-merchantable stem volume range between 4 and 13%. The non-merchantable part is further differentiated into stumps and stem tops (Fig. 4). Stumps were estimated to contribute between 2 and 7% to the non-merchantable part, and stem tops about 1 and 9%. The volume below the dbh-threshold was not differentiated for some NFIs due limits in the data. In these cases, the percentage of non-merchantable volume is slightly overestimated as it includes some stem volume thicker than the diameter threshold of 7 cm. According to the NFIs of Belgium, Ireland and Slovenia, the trees below the dbh-threshold contribute 0.3%, 0.7% and 0.9% respectively, to the merchantable part. Naturally, the lower size classes have the largest proportion of non-merchantable volume. Figure 5 shows the percentage of stem volume contributed by the trees below the dbh-thresholds applied by the 21 NFIs. Approximately around the dbh of 5.8 cm, the stem base starts to exceed the diameter of 7 cm. Thus, merchantable volume can be expected below the dbh-threshold when the thresholds of 6.4 cm and above are applied. The growing stocks of broadleaves for merchantable stem volume and merchantable stem and branch volume are given in Table 6. Branches contributed 3–21% to the merchantable growing stock of broadleaves. The Nordic and Baltic countries (Norway, Sweden, Latvia and Lithuania) showed a clearly lower percentage of branches. The presented harmonisation of stem volume estimates was implemented on a large-scale by 21 European NFIs. It is the first evaluation of the harmonisation efforts and the consequences of deviations, including the breakdown into the individual causes of differences. As a basic feature, the applied harmonisation approach maintained the existing sets of volume models of NFIs and complemented them by bridging functions to account for the deviations from the reference definitions. The mathematical forms of the volume models are power functions, exponential functions or linear combinations that describe the stem taper and the form factor, or directly predict the stem volume. Usually the volume models of NFIs have been developed from quantitatively and qualitatively representative data sets collected in laborious field work campaigns by destructive sampling which are described in many of the references in Appendix Table 8. The volume models of NFIs were elaborated, tested and validated under the respective conditions at country-level and can be expected to give reliable predictions for the individual countries. Models tailored to address national circumstances are required for higher order methods in international reporting and provide greater certainty than the lower tier methods which use less detailed data and less advanced estimation procedures (IPCC 2006). Depending on the respective situation regarding available data sources and implemented volume models, different approaches of bridging functions were applied by the NFIs. Among the presented groups of bridging functions, alternative volume models and taper curves are usually well-established in the respective NFIs and have been used and validated in earlier applications. Partly, this applies also to complementary models. However, several complementary models have been newly developed or were transferred from one NFI to another NFI with similar forest conditions. For the reason of such initial applications, the bridging functions were examined by the NFIs before integration into the estimation procedures to avoid biased volume predictions and to choose the most appropriate model among available options. The model examination includes comparisons with an independent data set, comparison with other models or expert knowledge if appropriate data are absent. According to Ståhl et al. (2012), the uncertainty of harmonised estimates depends on the harmonisation method applied. The different approaches of bridging functions applied in the presented work have their own specifics regarding the error of predicted sample tree volumes. Taper curve or alternative volume approaches can be supposed to have similar prediction errors at individual tree level for the un-harmonised and harmonised stem volume estimates. Because the original volume model and the bridging function are based on the same data set, no additional error sources are incurred by these approaches. Combining the existing country-level volume models with complementary models derived from other data sets can cause additivity issues for the volume predictions at sample tree level. Although the examination of bridging functions minimised such biases in the volume predictions, these effects cannot be completely excluded especially for sample trees outside the data range of model parameterisation. The bridging functions applied by the 21 NFIs solved all major and most minor deviations from the growing stock reference definitions. In some cases, minor deviations had to be accepted due to limits in the available data and models. For example, the stem volume below the dbh-threshold was not always differentiated into the merchantable and non-merchantable parts (France, Germany, Hungary, Portugal, Slovakia, Spain), the volume of branches was not calculated for two countries (Finland, Estonia), stem top or branch diameter thresholds other than 7 cm were applied (Portugal, Spain, Estonia), recently died trees were not excluded from growing stock (Germany, Serbia), lying living trees could not be excluded from growing stock (Belgium, Denmark, Finland, Serbia, Slovenia), and shrubs were not excluded based on the species but on the dbh-threshold (Belgium). However, the harmonisation of NFIs is a process of continuous improvement of methods, data collection and data analysis (Vidal et al. 2016b). As additional data become available, the approaches for harmonising stem volume estimates can be further enhanced. The development of the reference definitions for stem volumes and growing stock during COST Action E43 (2010) was motivated by the idea to have one unique definition as basis for common reporting. As the demands for forest information for international processes increase and information needs are diversifying, a more flexible scheme of reference definitions was established. The flexibilisation was motivated by several considerations regarding the volume contribution of the individual tree parts stump, stem top and large branches, and the merchantable part of growing stock. Moreover, aspects related to the estimation of broadleaved growing stock should be included. From an economic viewpoint, the potentially commercial part of the growing stock appears relevant. Denoted as percentage of merchantable stem, this part was calculated as relation between the stem segment from stump height to the top diameter of 7 cm and the whole stem from ground level up to the stem tip. The merchantable stem part was only defined by the stump height and the minimum diameter. Stem parts below the threshold of 7 cm were assigned to the stem top. Other important criteria like stem quality or length of assortments were not taken into consideration. Bosela et al. (2016) analysed the status of stem quality assessments by NFIs and found a large diversity in assessed parameters and approaches which require further harmonisation efforts to prepare comparable reporting of stem quality and merchantable assortments. The reference definition of Cost Action E43 (2010) focuses on the stem volume and indicates an orientation towards coniferous trees which usually have a continuous, monopodial stem from the ground until the stem top. For several broadleaved tree species, this concept has limited applicability. Countries with a larger share of broadleaves often include large branches in the growing stock because their wood can be used for similar purposes like stems. Therefore, the percentage of large branches in merchantable tree volume was calculated for broadleaves to evaluate their contribution to growing stock. To correspond with estimates of above-ground biomass, also the volume of small branches would be of interest. Due to the lack of volume models and data, the volume estimation of small branches could not be integrated in this harmonisation work. The implementation of stem volume harmonisation by 21 European NFIs has evidenced considerable differences between country-level and harmonised growing stocks. Differences between the country-level growing stocks and the common reference definition of Cost Action E43 (2010) were in the range of − 8 to + 32%. Differences of this magnitude indicate the importance of harmonisation when volume estimates are collated from different countries in international statistics (e.g. FAO 2015; FOREST EUROPE 2015). Such un-harmonised information can lead to erroneous conclusions in policy and decision-making processes regarding e.g. wood resource availability or forest carbon sequestration. Considering the individual deviations from the growing stock reference definition, branches have the largest potential to cause a lack in comparability, followed about equally by stumps and stem tops, and concluded by trees below the dbh-threshold. All deviations can contribute relevant amounts of volume and require evaluation when aiming at harmonised volume estimation. According to the presented results, large branches contribute between 3 and 21% of the merchantable volume of broadleaves. For most NFIs, the share of large branches was in the range of 10 to 15%. The non-merchantable stem parts consist of stumps and stem tops and together accounted for 4 to 13% of the whole stem volume. Stumps contributed between 2 and 7% and stem tops accounted for 1 to 9% of the stem volume. The trees below the dbh-threshold represent up to 6% of stem volume. The volume shares generally correspond to the figures of other studies (e.g. Cienciala et al. 2008; Hladnik and Kobal 2012; Kuliešis and Kulbokas 2009; Mantau et al. 2016) but also depend on the respective forest conditions in the countries. The results from the 21 NFIs generally represent a broad geographical range within Europe and reflect the differences in tree species composition, tree size distribution and management practices. The percentage of branch volume in broadleaved growing stock differs between Northern Europe and the Baltic region on the one hand, and Western, Southern, Central and Eastern Europe on the other. The largest values are found in Ireland (19%) and Serbia (21%) and are due to tree species like beech and oak, a large proportion in larger size-classes, and open-grown trees (Banković et al. 2009; Forest Service 2013). Birch and alder have finer branches than beech and oak and explain the small share of large branches in many northern European countries (3 to 5%) where these species are the predominant broadleaves. Additionally, the forests in northern countries have a higher proportion of trees in the smaller size-classes which also contribute to a low share of large branches. A large proportion in the smaller size-classes also cause lower percentages of the merchantable stem part. The share of stem top volume thus was higher in Southern, Northern and Western European countries. The influence of the size-class and tree species on the volume share of individual tree parts is illustrated by an example from Belgium in Fig. 6. While large branches contribute a considerable amount of volume for beech, Norway spruce has a negligible amount of large branches. Large and small branches together constitute a much higher volume proportion for beech compared to spruce. Note also that the share of stem top in the lowest size-class for Norway spruce is lower than for beech. The share of stumps does not change very much across size-classes. The tree species and size class distribution at country-level have a considerable influence on the magnitude of the individual deviations from the reference definitions. The accomplished harmonisation of stem volume estimates essentially contributes to the NFI harmonisation process in Europe. For the first time, comparable growing stocks are available on a large-scale for 21 European NFIs, and the discrepancy between un-harmonised country-level estimates was quantified. The results clearly show the importance of harmonisation for comparable NFI reporting in international statistics. As input for scenario modelling at European level (e.g. Barreiro et al. 2017; Sallnäs et al. 2015), harmonised stem volume estimates are equally important. The implemented stem volume harmonisation allows for estimating various growing stocks as e.g. the whole stem volume, the merchantable part and according to the Cost Action E43 (2010) reference definition, and thus enhanced the flexibility of NFIs in responding to different information needs. The common European NFI estimator (Lanz 2012) was recently developed further under the DIABOLO (2015) project and utilises the harmonised stem volumes to conduct further analyses for various information needs. In connection with the ongoing efforts to harmonise the forest area available for wood supply (Alberdi et al. 2016), the presented work provides the basis for future studies towards harmonised information on wood resources and forest ecosystems of the ENFIN (2018) group for supporting strategic decisions in related policy processes. We thank Heimo Matzik for preparing the figures and Ambros Berger for his helpful comments on the manuscript. We also would like to thank the anonymous reviewers for their helpful and constructive suggestions. The presented work was conducted as part of the DIABOLO (2015) project. DIABOLO has received funding from the European Union’s Horizon 2020 research and innovation programme under grant agreement no. 633464. Alnus glutinosa, Picea abies, Pinus sylvestris, Larix sp.